It's been established that fuel economy will be a priority for the 2015 Ford F-150, which has sparked strong rumors about a sub three-liter variant using EcoBoost technology at the expense of a traditional, entry-level V6 option. Ford's pairing of turbocharging and direct fuel injection has proven effective across their range at improving economy while retaining reasonable output, generally designed with the intention of balancing both. But Automotive News reports Ford hopes to pick up 3 MPG with the next iteration of the F-150. While the purported 700-pound weight reduction through utilization of aluminum will contribute to this, a high-efficiency variant could be essential to Ford complying with impending CAFE fuel regulations. The NHTSA and EPA are mandating an average of 34.1 MPG across all automaker lineups by 2016, and they're expecting trucks will have to average 28.8 MPG to get there. Since the Fuel Shark has been established as a non-viable option and the current 3.5-liter F-150 EcoBoost engine is designated as workhorse, a small displacement turbo could be Ford's ticket to a high MPG F-150. Ford had made it clear that the Ranger, which measures within ten percent of the F-150's size, is not coming back to America. A frugal F-150 could fill the gap to compete downmarket with the likes of the Toyota Tacoma, Nissan Frontier, and perhaps most notably the 2015 Chevrolet Colorado. 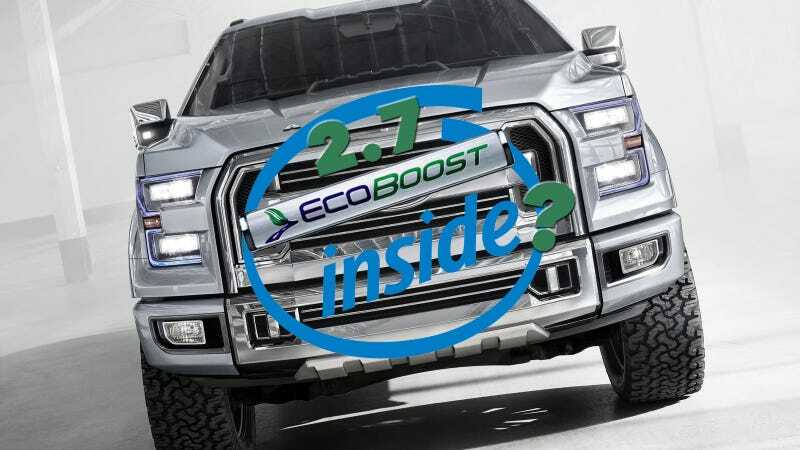 Forums are alight with rumors, but the consensus appears to be that a 2.7 EcoBoost V6 with 320 HP and 375 Ft/Lb of torque will be the smallest engine available in the 2015 F-150, right behind a naturally aspirated 3.0. The 5.0 V8 and 3.5 EcoBoost will reportedly stay in the lineup. Back in 2011, Mike Levine posted to his website PickupTrucks.com that Ford was working on V6 prototypes. Levine, it should be noted, is now the Ford Truck Communications Manager. Levine went on to say that the engines, code-named "Nano", had displacements of "approximately 2.6 or 2.7 liters and 3.0 liters" and were slated for use in the 2015 Mustang and F-150. Rather than twin-turbos, the Nano engines would utilize a dual stage snail setup with a smaller turbo working for fuel economy at low speeds, and a larger one for additional power. This is all still speculative, but the new F-150 is supposed to a big evolutionary jump for Ford so you should expect big changes.